Jammz - Warrior 2 Instrumentals. Vinyl EP. Bleep. 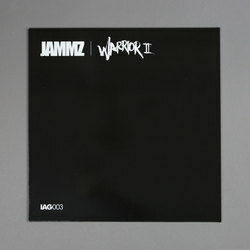 Jammz follows up his recent Warrior 2 album with the collection of instrumentals. Though known primarily as an MC, these vocal-less tracks prove that the Hackney artist is also a dab hand when it comes to the production side of things. Jammz has either solo or co-production credits on all but one of the cuts here (other contributors range from New York Transit Authority to Sebastian Sartor). Throughout these Warrior 2 Instrumentals the vibe remains cold and eerie - imagine a grime/road rap rendering of the spooky Metro Boomin beats for Offset and 21 Savage’s Without Warning.